Kensington is a rather beautiful place and great for photography – the pretty, tree-lined streets, smart buildings, bustling high-streets and green, open spaces mean there’s some beautiful sights around the borough. So here we bring you some photos of Kensington and Chelsea! We have several photo albums for you to look at, and they are of Kensington at very different times of year! The first are some photos of the area after some unusually heavy snowfall (and that’s heavy by London standards – so not really heavy at all) whilst the second is of Kensington on a glorious May day. 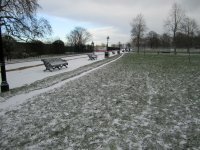 We then also have photos of the Winter Wonderland event that takes place in Hyde Park (so, just outside Kensington) each Christmas, followed by another snowy winter’s day in the area. Do check back in future as we hope to add more photos to this section of the website.